Our first watercolor course (aptly named Watercolor I from Semester I) focused on color theory and understanding the colors and paints you're working with. With this second step in Watercolor II, we will be building on our previous knowledge, moving on to more color mixing as well as understanding how different base shades mix together. We'll be mixing custom colors to match Pantone or printed shades, perfect if you're a calligrapher mixing ink to match a clients invitation. We'll also look at how to mix custom ink for dip pens. This second semester pricing course will dig a bit deeper into the world of pricing. 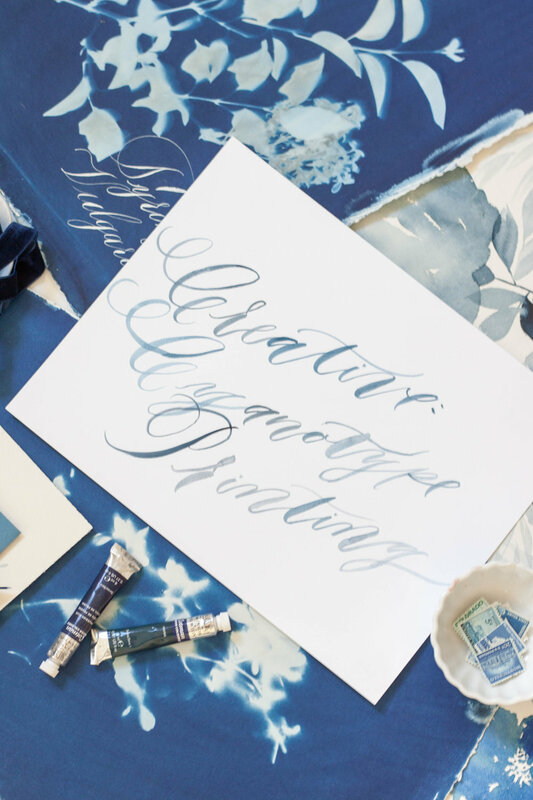 We'll look at specific pricing examples in two industry categories: custom calligraphy projects, and building a pricing sheet as a paper pusher (i.e. stationer). When we talk about pricing for custom calligraphy projects, this includes oddball projects such as large scale quotes, wedding vows, family crests, large menus, large seating charts, etc. We'll talk about how to price your time as well as the cost of product for these situations. In addition, we'll talk about building your pricing as a calligrapher and the different pricing structures that are available. The second example we'll get into is pricing paper, printing, assembly details, and your time as a stationer. Having estimates of these costs will help to dramatically cut down the time it takes to return quotes to clients while ensuring accuracy in your pricing. We love to include interesting creative techniques in our course offerings. As creatives it's so important to continue to explore new techniques and expand our horizons when it comes to our craft. This course focuses on design boards and how to utilize them in your own creative process to hone in on and communicate design scopes to clients. It works great as a follow up to the Sketching for Creatives and Establishing Your Creative Process courses from Semester I. 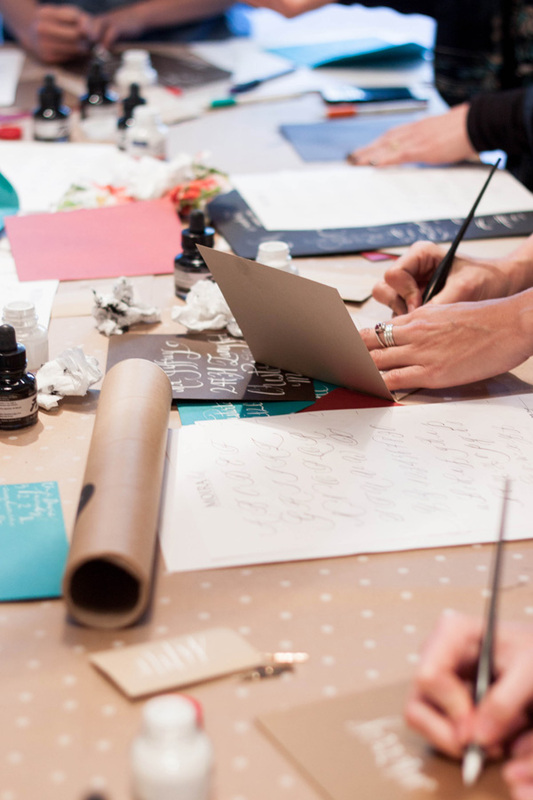 In fact, we would highly suggest taking at least the Creative Process course before this one, so that you can best put your design boards to work within your creative process. Further narrowing your creative process allows for less time doing the back and forth with clients as well as reducing the amount of time spent with too many ideas flying around. Design boards help both you as the creative, as well as your client, keep the end design goals in mind, stay focused, and work more efficiently. In this course we will discuss what design boards are and their purpose within your creative process and go through how to create one effectively. Whether you run your own business from a studio, balance a full time job with a side hustle and family, or anything in between, knowing how to prioritize your time is integral to running your business effectively and getting things done. Learning how to prioritize, eliminate, stay on task and delegate is life changing - it certainly was for me! Going from working 80+ hours a week to working 36 or less and taking the month of December off gave me the energy and drive I needed to build my business and stay sane. I've gotten a lot of questions and feedback from students about the difficulty they face in finding enough time in the day to do all the things they need to do. In this course, we'll get into the nitty gritty of necessity, learn how to prioritize our time and tasks, and get more done in a shorter period of time. As we finish up 2016 and head into our second semester of Design House Prep School, we are incredibly grateful for all the support we've received from the community. Semester I has been such a great experience for us -- we're so excited to continue offering those classes until the end of next June, and we look forward to continuing to build our community in the spring! This has been such a long time coming!! The Modern Calligraphy Summit begins at the end of the month and I'm so excited to get started!! Before we can begin, we have one more round of open registration before we close the doors! Registration will run through the end of the week, so don't delay. The summit will run for two weeks, adding a new video each day. Classes will range frombasic lettering, to brush lettering, developing your style, brush lettering, flourishing, envelope layout and so much more! We'll also be hosting two live webinars at the end of the summit to address business and pricing questions as well as studio/work space questions. Our private Facebook group for all attendees has also proven a wonderful platform for encouragement, Q&A and interaction with professionals. You'll have lifetime access to the summit videos to check back in and watch them again and again. This summit is the first of its kind and I'm thrilled to be part of it! 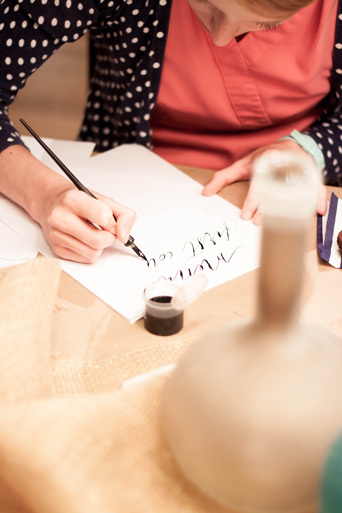 This is such a great way to kick start your calligraphy business, further your hobby, or pick up a new one! Want to get signed up before it's too late? Click here! 2016 has brought some really exciting new things for me so far, and we're only a week into it! I have a really awesome second announcement in a few days that doesn't even have anything to do with workshops! 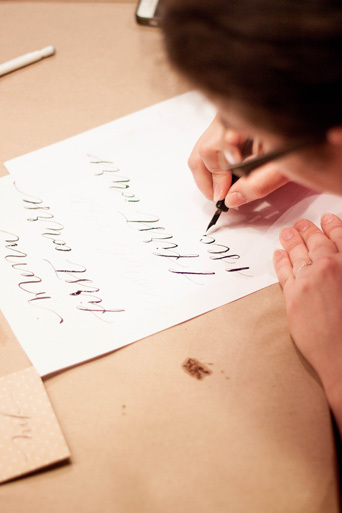 I've taught calligraphy workshops in the past both in hosting them myself and teaching at Paper Source for several years. I love teaching and being able to share my passions and obsessions with others, but I've really strayed away from it for a while now and I miss it! I have so many passions and loves, and anyone who knows me personally know that those passions tend to overflow into all other aspects of my life. There are so many hobbies I've collected over the years, experiences I've learned from, and business mistakes and successes and I want to share that! That all being said, I've decided to teach a series of workshops throughout the coming year to touch on all sorts of things. My current obsession and the focus of my attention is how to make money as a creative; creating a solid and consistent brand, and using that brand to target your ideal client and learning how to turn that into a money making business. I'm obsessed with studying it and can't wait to share it! 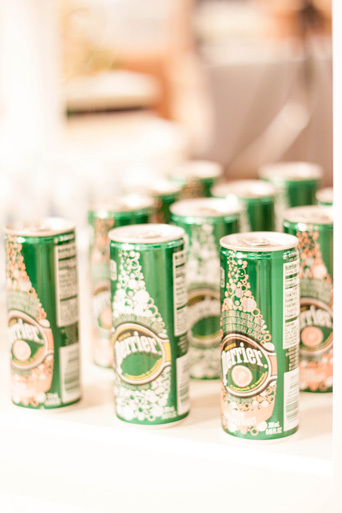 Many of the workshops will be geared towards creative businesses (experienced or inexperienced! ), but don't fret! There will be plenty for the hobbyist as well! 2016 brings another big change in my life. I'll (FINGERS CROSSED) be moving soon (yet again. This will make five major moves in two years, in addition to another 6 moves in and out of storage units and a 3,000 mile cross country move). Johnathan and I are house hunting for our forever home and are getting our currenthouse ready to sell. Something that is in the forefront of my mind as we house hunt is finding a home that has a large enough space or studio that I can host workshops in my own home (I mean, how awesome would that be!!). It would make set up a breeze and I would be able to host anything from an intimate class of just a handful all the way up to a full sized class. Being from California where everything is so spread out, I love how (relatively) close together everything on the east coast is! I would love to also be able to host traveling attendees who are driving in from other cities to attend (Hello, DC and NYC, I'm talking to you girls!). Right now, I'm asking for anyone who is interested to get signed up so I can see which classes are the most requested and who's interested, that way when I have some dates solidified, I'll be able to let you know. Head over here to get signed up! If you've ever had the pleasure of checking out the work of Natalie Franke, you're in for a serious pleasure! I worked with her, along side Kruse and Vieira Events for the gorgeous two-day Bayside Workshop in Queenstown, Maryland. 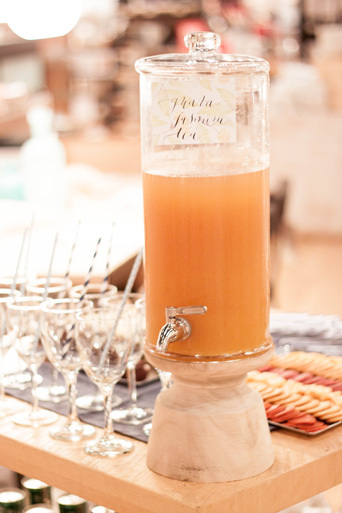 The swoon worthy photographs were featured on Grey Likes Wedding last week! 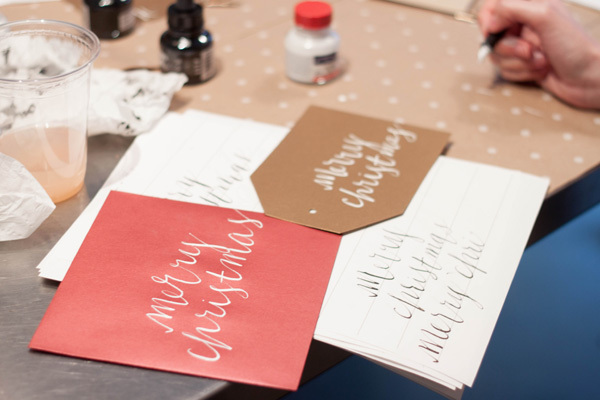 Here are the invitations I create for the workshop, with more lovely pictures to follow! 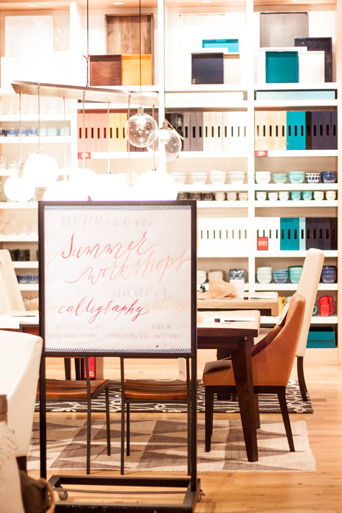 I am thrilled and excited to announce my partnership with West Elm!! 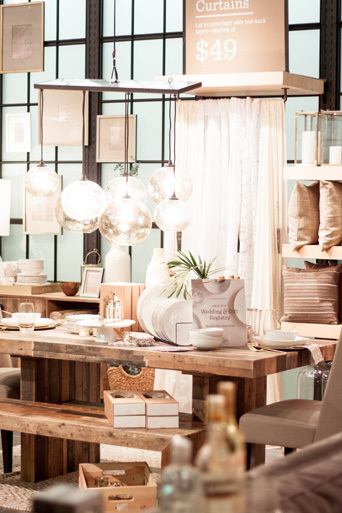 I have created a summer workshop series to be hosted by West Elm Philadelphia. Starting mid May and continuing every other week through August, we will be focusing on creating a memorable and personalized dinner party. We kept the cost down so everyone can come and enjoy the fun! You can register for the workshops through the Studio Shoppe here, as well as check out the details of each workshop. 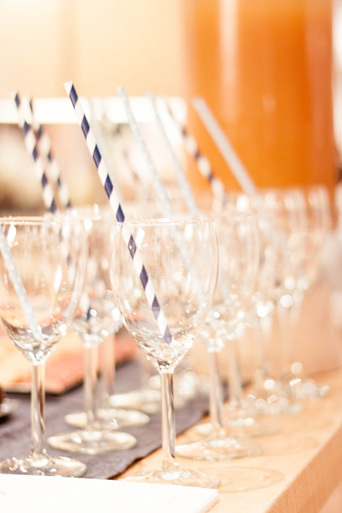 The evenings will include quickfire calligraphy and lettering classes, summer cocktail recipes, monogramming your table linens, personalizing glassware, and much more! 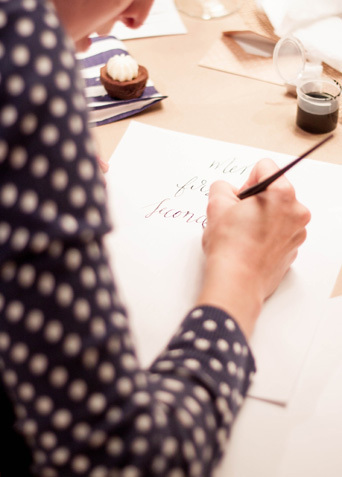 We had such a lovely and amazing time teaching our first San Francisco calligraphy workshop! 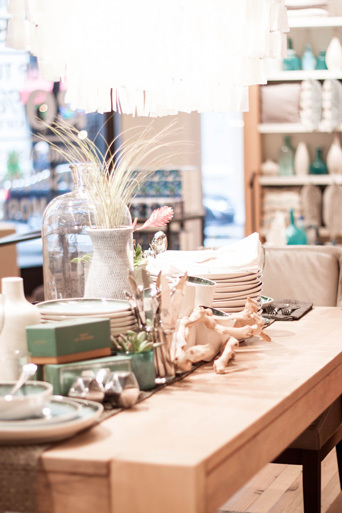 We had the beautiful Natalie from Natalie Bowen Design host us at her darling new studio in SOMA. Her studio has several workable rooms and a large patio out back. The entire studio is bathed in gorgeous natural light with an amazing collection of curated vases and florist tools...plus the MOST amazing wallpaper in her powder room! For this particular workshop, we taught a specific font style. 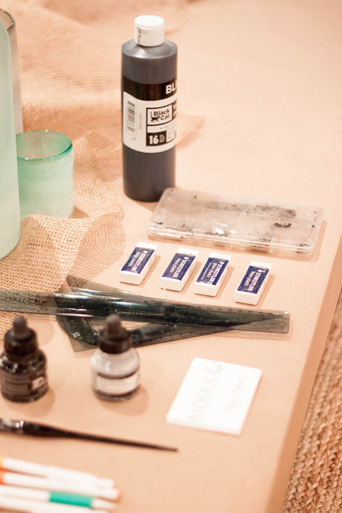 The kits included a white ink, black ink, pen holder, and 4 nibs. We also included a full lettering exemplar of the letter with several phrases and words done in the font as examples. We topped the whole thing off with some envelope and paper products from our favorite Paper Source. 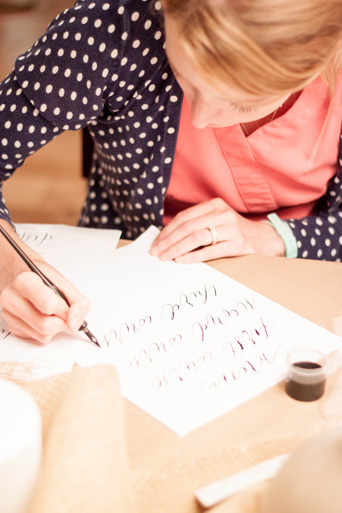 We are so thrilled to announce the launch of our calligraphy and lettering workshops!! You can register for either our San Diego calligraphy workshop (October 26th) or San Francisco (November 10th) through our Studio Shoppe! We'll be adding an additional San Diego (La Mesa) class as well as a second San Francisco class soon! 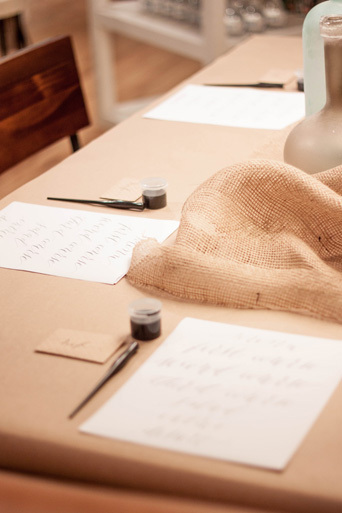 Our calligraphy workshops will cover beginning calligraphy techniques, review and style and entire font set, learn and review basic flourishing, centering, ink types and mixing colors as well as the basic supply options. 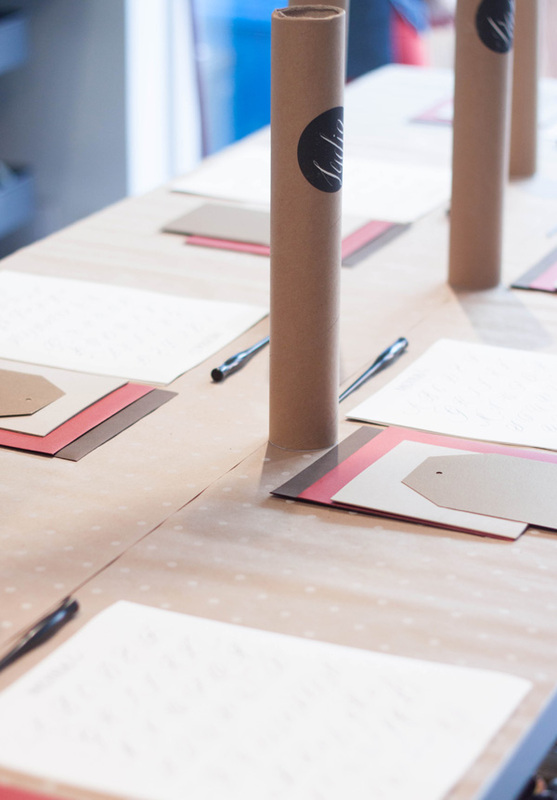 This workshop is perfect for soon-to-be brides (and their bridesmaids!) as well as industry professionals, shop owners (talk about having adorable signage! ), crafters and scrapbookers, as well as anyone looking to learn a new skill set.